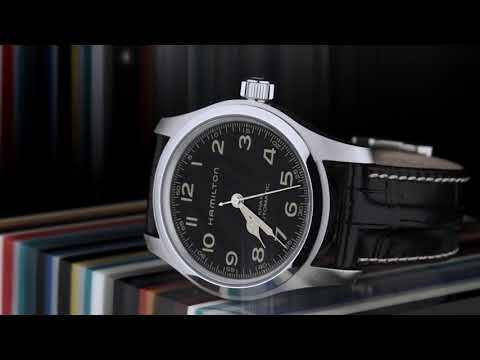 Hamilton was founded in 1892 in Lancaster, Pennsylvania, USA, Hamilton watches combine the American spirit with the unrivalled precision of the latest Swiss movement and technologies. Known for it's innovative design, Hamilton has a strong foothold in Hollywood, with products appearing in over 450 films. The brand also boasts a strong areonautical heritage. Provides rugged construction and elegant design. Combines innovation and modernity; its classic elegance makes it irresistible. Design detail of the case of the new model mirrors that of its ancestors. Providing classic aviator styling and/or functions specific to the needs of a pilot. In 2019, Hamilton celebrates the magic of the movies as we turn the spotlight on our unbreakable bond with Hollywood. Since 1932, our watches have appeared in over 500 movies and each reflects our close relationship with Hollywood.